the building of the common life between the guests, volunteers (vollies) and resident staff. Therefore guests had part in the preparation of worship as well as sharing household tasks and serving at meals. 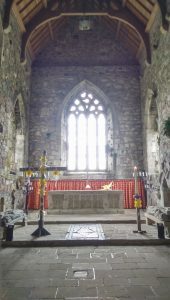 I have separated that into three the people who live and work around the Abbey under the auspices of the Iona Community. Those are the boundaries as used by the community but the boundaries are not as clearly drawn as such. The guests do work, that includes serving and washing up after meals, household tasks including cleaning toilets and participating in the preparation of worship. The tasks are less arduous than those undertaken by the vollies and Residents but still necessary for the well functioning of the Abbey. They are not purely symbolic. Technically most resident staff are also volunteers but long term with contracts (between nine months and three years). There is a subtle and complex interplay between these three groups. The worship team, i.e. the resident staff who have a contractual responsibility at present for worship are Rosie (Director), Deborah (Sacristan), Richard (Musician) and Callum (Musician). I was a guest. There were around 37 guests present this week and in three chore teams. Most of the rooms were shared with twin or bunk beds. The rooms are cosy space wise and this is good because it also helps with their cosiness in other ways as the building has limited heating. From our perspective, the preparations for the Triduum started on Monday when people start preparing for the stations of the cross on Good Friday. The Iona Community takes overall organising responsibility with Bishops House Retreat Centre for the one at the Heritage Centre and the Parish Church doing the one at the Parish Church. 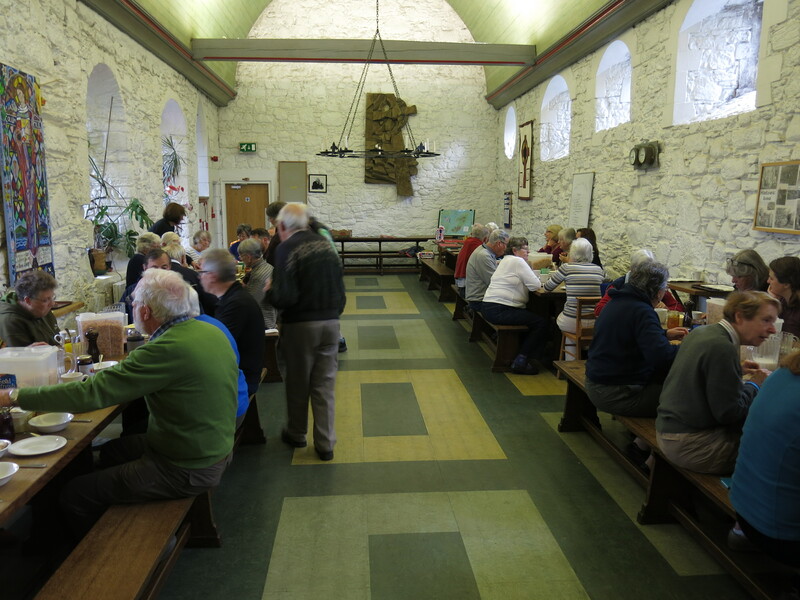 The Iona Community then asks the guests for the week to prepare the other five. 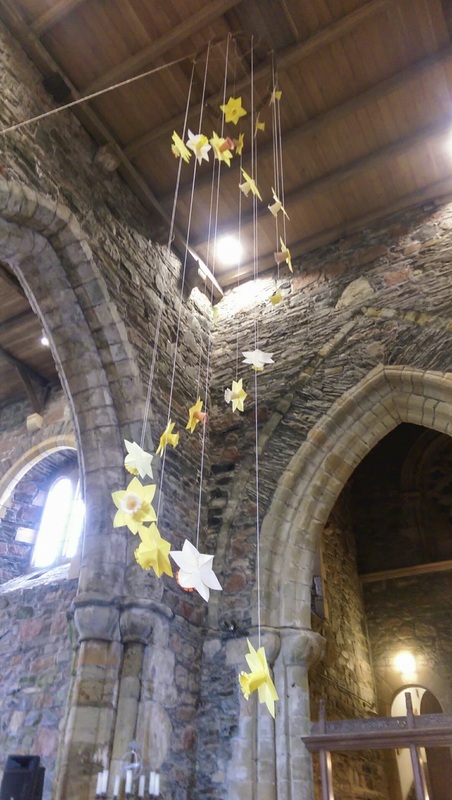 The second part of preparation that was handed over to us was the sermon slot for the communion on Easter day. This, however, only started on Wednesday. Actually, you could say we divided ourselves into seven teams. The five for stations of the cross, one storying team and a movement team who eventually ended up being involved in the Easter Sunday Evening Service. The third part, and it is only third because I keep forgetting it was done, was the Big Sing and the not so Wee Sing. These are times when guests are taught the music for upcoming services. This is not a choir rehearsal but a chance to familiarise us with the music and teach parts. 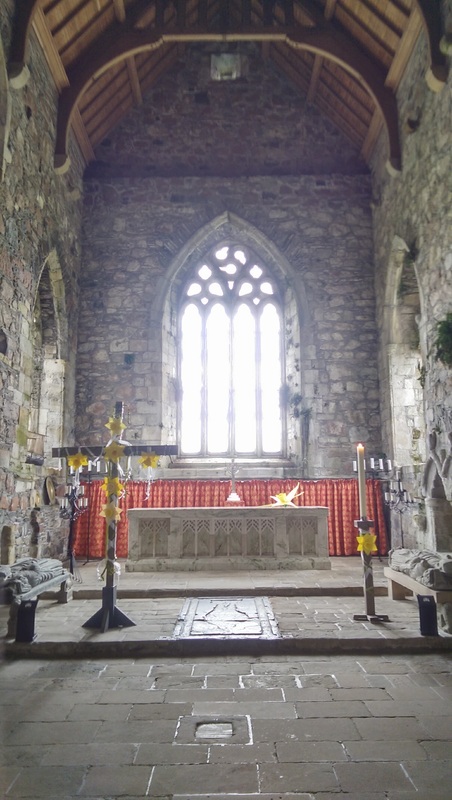 If you have ever been to Iona Abbey services and participated in the congregation singing happily in three parts, then this is how they do it. Basically, a significant proportion of the congregation has already been primed. I was spoilt as the number of musicians among the guests was large and therefore we did four part rather than the usual three part harmonies. The first service was the foot washing which happened on the Tuesday in the Chapter House. 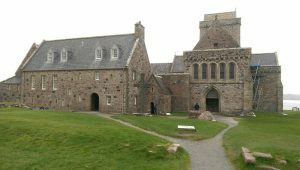 That might seem odd being outside the Triduum but Tuesday is the day the Iona Community runs pilgrimages around the Island. There are two an on-road and an off-road. Therefore there are lots of tired sweaty feet in the afternoon. In other words, the timing was chosen so it was at the point when feet needed washing. Oddly we were a fast group and three of us had already gone through the process of cleaning our boots! It was low key. Rosie explained what was going on. The song “Brother, sister Let me serve you” with resident staff and vollies making sure that water and towels were available. The process of washing feet was mutual. Anyone could sit in a chair for their feet to be washed; equally, anyone could take the place of the foot washer on the floor. This focussed both on the foot washing from John’s Gospel but also the institution of the Lord’s Supper. There has been a large use of John this Lent, not quite sure whether that is because Matthew is difficult or just people wanting John for a change. The room was packed with the tables put up against the walls, the benches and upright chairs in front of them. The poem “Directions for using a towel” was read, the hymn “Great God your love has called us here“. That hymn is one of my favourites simply because it catches the complexity of the human condition in ways that speak to the sociologist in me. There were four stations at which communion was served: one for Judas, one for Peter, one for Thomas and one for another disciple with us being asked to go to the one that reflects where we are at. The service closed with us leaving singing Jesu Tawa Pano and processing to the Abbey. The Abbey was then stripped. That is any ornament that could be taken out of the Abbey was removed including the Celtic Cross that is normally on the high altar. Anything that could not be removed was draped in black and all the candles were put out. The photo shown was taken I think the following afternoon but it gives an idea of the starkness of the stripped church. This was all done in total silence and the residents and volunteers doing the stripping were all dressed in black. We left our way lit by battery lanterns and we all went out by the main door rather than to the cloister. Now I am going to have to give an impression. The day was dreich and full waterproofs were a good idea. On the other hand, it certainly attracted people and by the time we got to jetty there was a crowd following the cross including Iona Community members who were not part of the staff at the Abbey. In between each station, we moved singing a short chant quite often from Taize. I am afraid it did not really get going for me until the women at the Nunnery where we heard the interaction between Mary, Jesus’ mother and modern women’s stories. The Bishop’s house connected Jesus’s fall with all the whys we have. The cross was dropped and instead of a man picking it up a woman did. 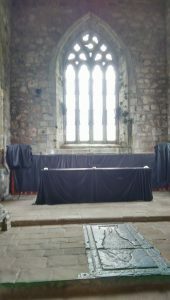 The Parish church was a meditation by Barabbus asking us whether if we could get out of suffering we would not let someone else take it for us. The crucifixion was two monologues by two soldiers taking different aspects. One took the Dorothy L Sayers idea that one might have been the centurion whose servant had been healed by Jesus. The final one involved taking the body of Jesus and laying it in St Columba’s Shrine. Then the door of the shrine was slammed shut. From 2:00 to 3:30 pm there was a vigil kept in the church. I along with many others by this time was flagging. I dropped off a couple of times during the vigil but stayed. However, quite a few others left early precisely because they were falling asleep. The result was the Abbey which was about half full at the start of the vigil was only a scattered few mainly in the choir seats and we drifted out after the end. That evening it was a dispersed service. 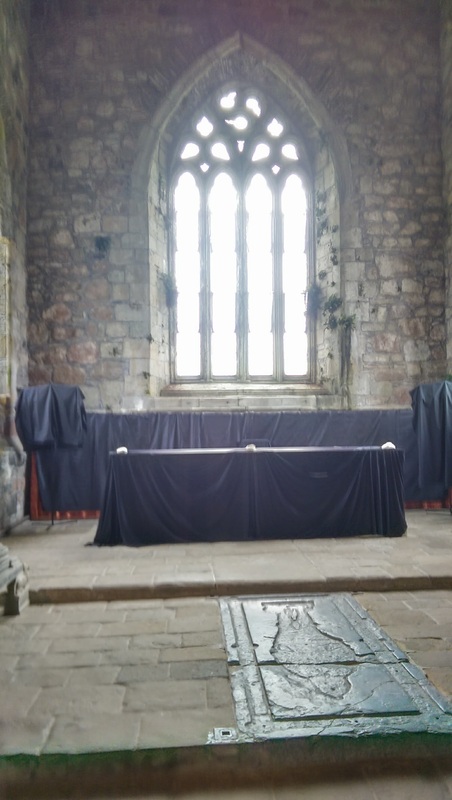 This was services in small spaces around the abbey. 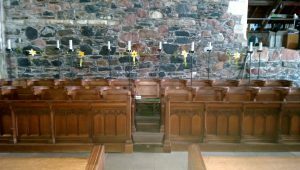 For instance, there was one gathering in St Columba’s Shrine, one in the Abbey Library and the one I attended in the Burrows. I went to the Burrows for two reasons. Firstly it was warm and worshipping in the warmth appealed to me. Secondly, it is a utility space used for washing and drying clothing and sheets and as a short cut to the kitchen. It really was the core space for me while I was a vollie on the Abbey Housekeeping team over a decade ago. The service was short and focused on a reading of Lamentations 3. In the Burrows, there were 6-10 people present and we were full. Easter Eve started once again with the morning office in the stripped Abbey. This was very routine. The differences from normal were slight in that there was no music playing when we came in and we sang unaccompanied. 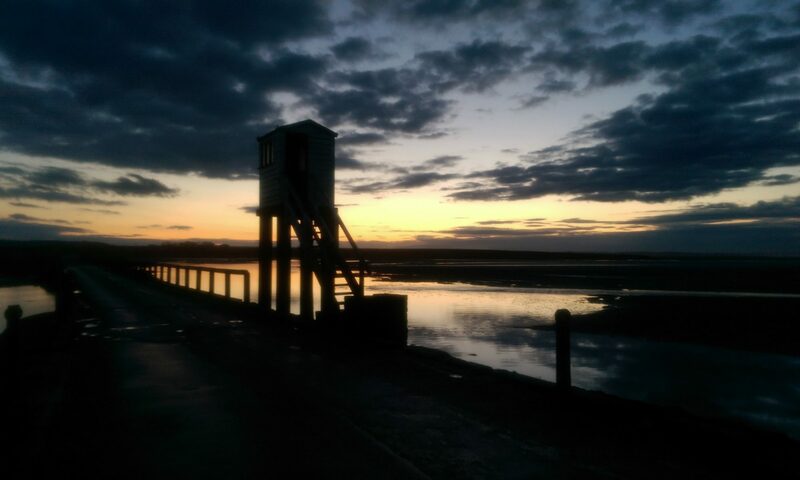 On the evening was a service of waiting. This gave time to reflect on the actual importance of paying attention to waiting. Again a very stripped down service and quite meditative. This was kept as a partial fast day as I think was Friday and no puddings were served but only fruit. Oddly enough outside of worship, an excitement was beginning to boil as the last preparations were being done for the Easter day service. Easter day started with a 6:15 at St Oran’s Chapel. This is the chapel in the burial ground beside the Abbey. The day had a damp start and once again I could have done with waterproofs trousers as well as coat and walking boots. The acclamation was joyful and we were handed a flower (not necessarily a daffodil). There were candles representing Easter fire but in the damp, they were rather poor. A good volume of Halle, Halle, Halle as we walked from St Oran’s to the Abbey where we left our flowers at the font before progressing through the cloisters for the Wee Breakfast still singing. The Wee Breakfast consisted of Simnel Cake and Hot Chocolate (alright I was a party pooper and chose hot cross buns and tea but that was just me). 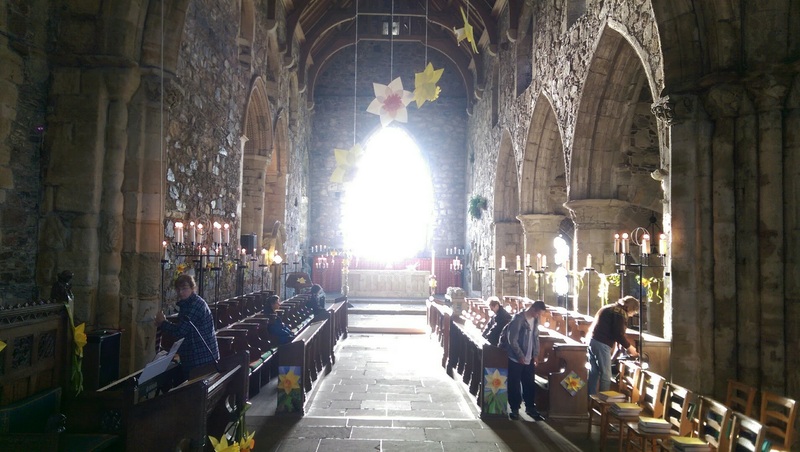 Sometime between the waiting service and 9:00 am on Easter Sunday the Abbey had been re-decorated with daffodils everywhere. 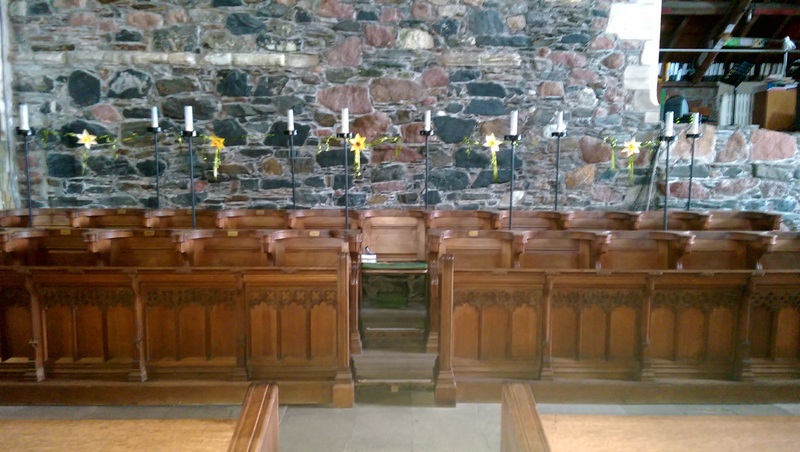 The cross with the daffodils on it was actually carried down at the start of the service and the high altar had a white communion cloth on it. The candles were lit unlike in the photos which were taken on Sunday afternoon. I had a reserved seat for the service because I had been part of the storying group and needed to be able to get to the microphone at the main desk. The attendance was such that people were standing outside the Abbey and therefore the doors could not be shut. Handbells were used twice during the service and we also had a group of guests doing shape-note singing. The hymns tends to be modern versions of Easter classics so we had “God given Glory” instead of “Thine be the Glory” and a new version of “Jesus Christ is risen today” both by Jan Sutch Pickard. Equally the form was actually very strongly based on the form given in the Iona Abbey Worship Book with seasonal words used. The text for the service was John 20:1-18, this got represented three times. Firstly it was read, secondly the modern form of “Jesus Christ is risen today” tells it again and finally, the storying group had interwoven this story with the stories of others told during the week and finished with an invitation to create a new story. You would think with all that, that Easter was over but this was the final day on Iona for us guests and we would be leaving on 8:50 ferry next morning. Thus, as is customary the night before guests leave, there was a service of commitment. It was a quiet abbey in the evening where a good number of people gathered for the service. I know because I was sat in the choir stalls when we were asked to come forward for the act of commitment and for a considerable time after I returned to my seat people filed in. The movement which was based on actions symbolising community was done in silence in the space before the act of commitment. It felt the most personal service. This was odd. Commitment services usually have high guest inputs but because we had been so busy during the week we did very little apart from the movement and yet it still drew us in. but it hardly says that because the words are deliberately put in the wrong order. You see Humpty Dumpty is wrong, words are symbols and symbols get their meaning through use and relationship. That is how people use words and the various connections, rules and associations that we apply to the use of the word. Syntax and grammar are just two of these relationships. bit on it Osiris, Ra. once spoking your valleys with light. the Indian and African railways. That’s why you learn it today. According to Homi Bhabha this is taken from Adil Jussawalla‘s poem Missing Person. What Bhabha points out is the use of “अ” which is the first letter of the Hindi alphabet and takes the sound “er”. It ‘misplacement’ make the monoglot English speaker, such as me, stumble as we do not have the skills for interpreting the symbol. Yet oddly in that stumbling might make the intended sound, showing his poetic skill. The symbol used where it is not expected causes a tension within the poem. It carries meaning but takes it at the cost of being unintelligible. If you have travelled with me so far, you may at least be persuaded that symbols at least in part take their meaning from their use and relationships, if they are placed elsewhere they change their meaning but that change comes at a price and that price can well be incomprehension. Let me now turn to liturgical practice. It is accepted that all acts of worship include the handling of symbols. At the most basic level because all human culture involves the handling of symbols. That meanst that within the worship setting there is a system developed of handling symbols and in doing this the symbols gain specific meanings. Quite often the meanings are left unspoken or explained and it is assumed an initiate can read them. 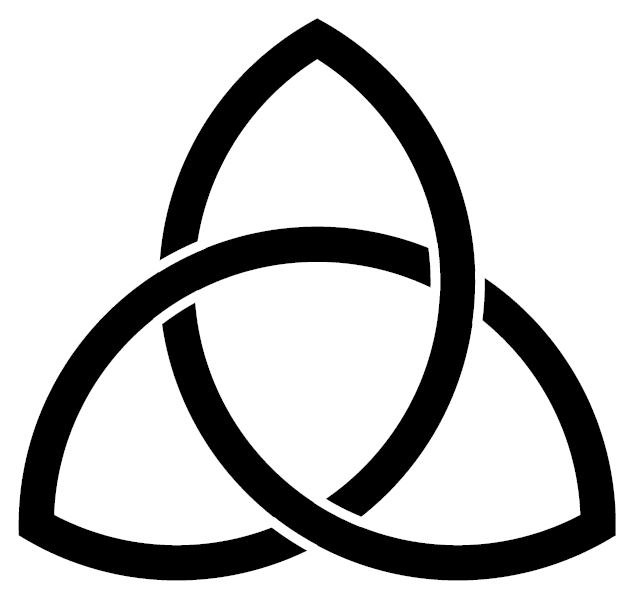 Now in the current ecumenical age it is often assumed that symbols may be lifted from one rite and placed into another without altered meaning or even with an alternative meaning. It should be clear from what I have written above that actually such behaviour is an act of colonialism. That is the persons so doing it, are trying to appropriate that which belongs to a symbolic system not their own and to incorporate it into their own. To a certain extent this has always gone on and the CofE as the most powerful colonizer in the UK is a past master at it. However just because the URC is a bit player does not excuse it when it does similar. I am not going to say never but the use of a symbol from another symbolic tradition needs to be done with care. There are dangers. Firstly the transplants tend to act rather as the अ above. That is they take on a similtude of their intension rather than the actuality. Sometimes they can even mislead. My colleague at work, someone who as far as I know is a thorough going secularist and most of the time is not bothered by religion, for a few weeks in his late twenties took to wearing a cross. He wore it upside down. I decided this could not go uncommented on so I asked him what his devotion to St Peter was. So you need to be careful about the relationship between what the symbol means in its original symbolic system and what you intend it to mean. Secondly the introduction of a new symbol into an already existent system has knock on effects. That is they have a tendency to smuggle in more than the smuggler intends. The result is a rearrangement in the meanings associated with the other symbols within the original system. The liturgical year is only brought into non-Conformist worship at the expense of the careful exegetical preaching through entire books that formed one of the planks that made us whole Bible people. That was not the intention of the innovators, they wanted to get away from preaching on a passage of your choice but now huge chunks of the Bible are rarely preached on. Therefore I would suggest that care was taken when you move a symbol from one symbolic system to another. The movement should not be in such a way that it denigrates the integrity of the original symbolic system; the movement should be careful that the symbol works in an effective way within the system into which it is placed. We are humans, we live within a culture and are bounded by that culture. Humpty Dumpty is wrong, because our use of symbols can never solely be what we intend them to be, they will always Janus like look back towards the previous uses and on towards the future uses. The meaning never fully resolved within the instance they are performed. A reason why the episcopal churches aren’t getting the liturgy they would like! This is part two of my pieces from this conference. It also in part answers why Liturgical Studies has not addressed issues of power. I offer this in the sense of ecumenicity and partly because I am in non-episcopal tradition, I can say things people in those traditions can’t. Lets get the definition out of the way, by episcopal, I mean ruled by Bishops. So Roman Catholicism and Anglicanism are both forms of Episcopal churches. It is technically possible to have Bishops but not be Episcopal. There are situations where the Bishop is the chairperson of a council that rules rather than the individual through whom power moves. What I gathered from the process was that basically what they were doing was gathering together a number of people who had studied liturgy, asking them to work on the new edition of the liturgy, then taking it to the Bishops who if they did not like it, chucked it out and re-did the work themselves. What is more if someone higher than a Bishop did not like that, then they chucked it out and re-did it once again. In my home church, we have an eldership which at times requests a group of members, normally a mix of elders and non-elders, to carry out a piece of work on behalf of the eldership. The assumption when the piece of work is done is that it will be accepted. If it isn’t accepted the first line is not for the elders to do it again, but to refer the task back with a directive request from the elders. Quite often a committee will suggest several routes forward and the elders will select which or ask for more information. To reject it out right given that the elders requested the work in the first place is seen as bad form and only to be done as a last resort. Now if a local church can think that far why cannot a Bishop’s council. You would not set a group solely made up of English Literature students to write a piece of poetry to be performed, or a group made up solely of Historians to stage a pageant, would you. However that is basically what the committees are being drawn from. This creates problem as the concerns of tradition and doctrine are pushed to exclude such things as drama, and performance. Safety becomes the dominant thoughts of those carrying out the task. What is more it is the interpretation of the critique and not that of the lay person participating that is dominant. The fact that there is solely an authorised liturgy to use is also problematic. People just cannot get the experience. I a lay non-worship leading individual has probably written more liturgy than most of the Liturgist in episcopal Churches. I simply have written stuff for weekly services when required and for personal devotions. I started doing that about 9 or 10 years of age; normally I work as part of a group, so I learnt from the senior people. Everything works towards being conservative and going with the dominant power. This has become a highly controlled process,where the central discourse is the only one that matters. Now I am not in favour of a total centrifugal process, that is chaotic, but a centripetal one is conservative, dry and rigid. It really does not have the vitality to survive the changing society around the Church. The effect of keeping thing under this sort of control is not to stop change but to make change huge when it does happen. The fact that any difference from the centre is over-ruled may make for a uniformity but does not make for a healthy tradition. It is alienating those who would support a more tolerant centre and in so doing it is creating a smaller group of people who have power, and a larger group of people who feel marginalised. To be healthy a tradition needs ways of including the insights of those on the periphery. and develop more open consultative methods so as to incorporate the insights of the laos, the entire people of God. At present I suspect that this is being handled differently at present within the two traditions. In Anglicanism it is leading to the increased use of non-authorised liturgies, whether it is through the use of evangelical style praise services or through the use of Roman Catholic or historical liturgies. Within Roman Catholicism I would expect a growth in folk devotion and a decrease in the attendance and centrality of Mass. Right this is the first of two short pieces in spired by attending this conference. I was the only URC person there, although there were a couple of Methodists, a solitary Pentecostalist and an American Reformed Pastor. Apart from that everyone was either high church Anglican or Roman Catholic. At one point someone said that they wished that more “Free Church liturgical theologians would come as those that do are interesting.” Well here is my reason why such people don’t come. Firstly the discourse of the conference is totally against them coming. They define themselves as “liturgical” and free churches as “non-liturgical”. Now why would someone defined by a liturgical conference as “non-liturgical” come to it? They are wanting Non-liturgical liturgical theologians to attend. Sorry that is like asking for hot cold water or is oxymoronic. If they want free church liturgists and liturgical theologians they need to make a space for them. Secondly our liturgists and liturgical theologians are very different from theirs. The prime task of them is to write the liturgy and they do it week in and week out. They are not primarily critics of liturgy and by that I mean those who bring their mental faculties to the task of analysing how liturgy is produced. They are primarily artisans producing liturgy week in week out. It would never occur to them that you might invite in later a poet, or musician to the creation of liturgy as if there is some secondary function they could add. The skills they bring are part and parcel of the task of creating liturgy. A sating in the Biblical text, sometimes seen with elderly Presbyterians with the Psalms where not only can they summon verses to memory at will, but their language is shaped by it. A biblical scholars sensitivity to the meaning and interpretations of the text. A Sociologists awareness of how people participate and comprehend the liturgy and the role it plays in religious formation. At the moment only about four of these functions are acknowledged in the conference. Where were the workshops where people brought examples of their own work and worked on improving it? Where were the discussions on what people understood of the liturgy and took with them? Where was the collection of folk liturgy, the prayers of the everyday people? If the Society for Liturical Studies, wants to include those from the Free churches in England it is going to have to make a space and begin to understand that valuable though the historical and critical study of Liturgy is, it is not the sole concern of an active working liturgist, at least not when there is Sundays Worship to prepare and you cannot just pick up the book and read it.